Definition (according to the Ohio Department of Natural Resources) "Aquatic invasive species include both plants and animals that have been introduced to our waterways and have become harmful to native species and their habitats. Aquatic invasive species may live entirely within or partially in an aquatic habitat." The Ohio Invasive Plant Assessment Protocol was designed to focus only on non-native, terrestrial plants. 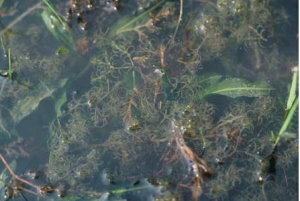 For non-native aquatic plants, the most appropriate assessment protocol is the Aquatic Weed Risk Assessment Tool for the Great Lakes region (GL AqWRA). This protocol was developed through a collaboration of federal agencies and non-governmental organizations, and is described in a publication in Management of Biological Invasions by Crysta Gantz and co-authors. The actual questions and scoring rubric of this Tool appear in Appendix 3 of the online supplement to this publication. To view the scores of plant species assessed by GL AqWRA see Appendices 1, 2, and 4 of that supplement. Note that Gantz et al. recommend species scoring 57 or higher be considered 'high risk,' or if greater caution is desired, using a score of 32 to distinguish 'high risk' species.